Pakistan is the world’s largest producer of poppy seeds, but the Austrians are no slouches, they produce about 1,000 metric tons, annually. The technical term for that is a whole lotta poppy seeds. Poppy seeds show up all over Austria baking – dusting the top of your bread rolls, sprinkled over butter smothered dumplings, and inside your cake. Recently, the EU passed new menu labeling guidelines, allowing diners to understand if their choices contain dairy, nuts, wheat – most of the foods that set off the allergic and intolerant. The labeling guideline includes the current villain of choice, gluten. “So ein Schmarrn!” is a handy of Austrian German slang for “What a mess!” Schmarrn is also the name of dessert that’s not much more than a scrambled pancake. (Pancake is a kind of cake too, friends!) The Kaiserschmarrn got its “Kaiser” prefix because it was a favorite of Emperor Franz Josef – he of the fondness for Bundt cake. 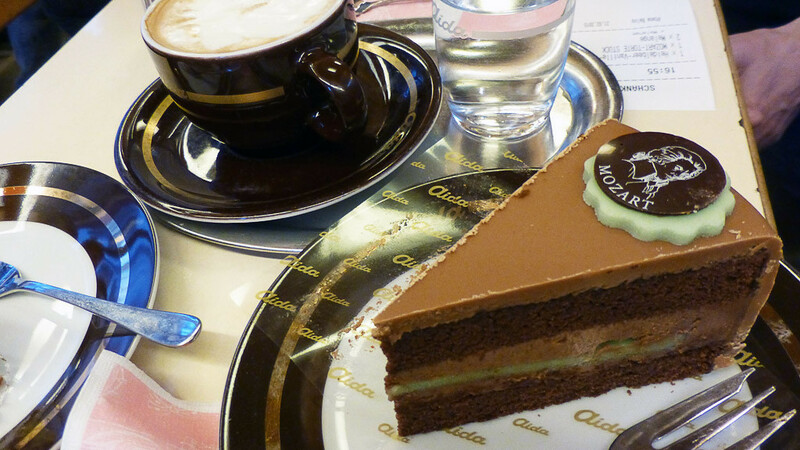 The Hotel Sacher is a grand old property in Vienna’s first district. The ground floor café has marble topped tables and red upholstery and the wait-staff are attired in black with white aprons. There’s a conservatory that faces the street and in the summer time, it’s transformed into open air seating. The neighborhood is amazing; the Hotel is right across the street from the Opera House. The Hotel opened in 1875 – Grace Kelly stayed here, as did John F. Kennedy and Rudolph Nureyev.